Casa Del Canto is ideaal voor familie- en vriendenbijeenkomsten. Het is centraal gelegen tussen Nationaal Park Zion en St. George. Het is ongeveer 45 minuten rijden naar Zion en 30 minuten rijden naar St. George. Sand Hollow State Park met zijn meer, watersportactiviteiten, ATV, duinen, golf, enz. Ligt op slechts 10 minuten afstand. Afgezonderd en stil, maar toch bent u enkele minuten naar restaurants, winkels, attracties en outdoor activiteiten. Het is een modern eengezinswoning met prachtig uitzicht op de berg en de vallei. De master suite met uitzicht op de bergen heeft een kingsize bed en een eigen badkamer compleet met een inloopdouche en een jacuzzi. De tweede en de derde badkamer heeft een kingsize bed en een gedeelde badkamer. De vierde slaapkamer heeft dubbele stapelbedden. Er is nog een complete badkamer naast de keuken. De keuken is uitgerust met gasfornuis, koelkast, vaatwasser, magnetron, koffiezetapparaat, potten en pannen, enz. Geniet van uw diner in de eetkamer die tot 10 personen kan zitten. Familiekamer heeft dubbelzijdig gas open haard en 65 "flatscreen-tv met lokale kanalen, Amazon prima films en Netflix. De omgebouwde speelkamer heeft een air hockey tafel, een tafeltennistafel en diverse bordspellen. Overdekte patio met teakhouten meubels en pelletbbq grill zijn allemaal van u te genieten. Na een volle dag buitenactiviteiten kunt u oefenen, ontspannen en ontspannen in onze 14 voet zwembroek, compleet met zwem- en massagestralen. Casa del Canto was beautiful! Perfect retreat after long days on the trails in Zion. The swim spa was relaxing, the views breathtaking, and the stars at night had us speechless! Comfortable and welcoming space with all the amenities. Our kids loved the game room, and we loved the sunsets at night. 🗻☀️Tia was accommodating and responsive through our stay. My only suggestion would be to stock pool towels for guests. Thanks for helping us make it a memorable vacation at Casa del Canto! We hope to be back! The views from the house are spectacular! This house was perfect for our family vacation! It was a beautiful and clean house. It had everything we needed. We will definitely be back! 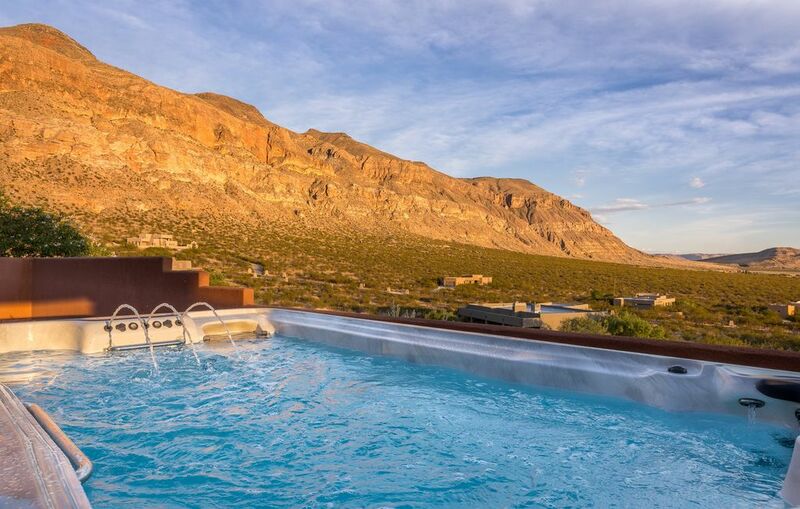 Wonderful location with a fantastic hot tub and view of the stars. We stayed at this property for the Christmas holiday and enjoyed all the area had to offer such as hiking, UTVs, mountain biking and the clear, starry nights of Utah. Although not luxurious with linens and overall decor of the house, everything was adequate and the house itself had many upgrades such as a jetted Jacuzzi tub, a wonderful terracee, a walk- in shower in the master bath and a gas fireplace. The game room was a nice bonus and was enjoyed by all. Our Christmas trip to Utah is going into our history book as one of the best family trips ever! Due in no small part to this wonderful home. The home was welcoming, full of amenities, and has the most amazing view from the swim spa. When we first stepped into the home, there was the feeling we had won the lottery! Tia (Owner) has thought of everything. Tia was quick to answer any questions we had and checked in while we were there to see how things were going. We love to cook as a family, the kitchen is chef grade. The game room was a big hit. Super bonus - this home is not far from the parks. I would highly recommend this home for anyone wanting to elevate their Utah experience. Beautiful home away from home! This house was awesome inside and out! The beds we're all very comfortable and the layout was great for a large group. The best part of all was the huge swim spa underneath the amazing night sky. This place was a short drive to grocery stores and restaurants and about a 40 minute drive to Zion National Park which didn't feel that long if a drive being surrounded by the awe inspiring views. Also the owners are wonderful and respond quickly with questions. You can't go wrong staying here! Beautiful home with everything we needed in a home away from home! Casa Del Canto is such a beautiful home with incredible views! We really enjoyed sitting in the hot tub at the end of a day of hiking in some of the nearby parks like Zion and Bryce. It was the perfect spot to watch the sun go down each evening. The homeowners have thought of every little detail to provide you everything you could need. The home is comfortable and the shower in the master bathroom is to die for - great pressure with many jets - it's a dream shower! The homeowners were also great about checking in with us to make sure we had everything we needed. I highly recommend this home! It is perfectly located close enough to Zion and yet far enough away that you're not in the middle of all of the park and tourist traffic, in the quaint little town of Hurricane. Loved it! Rates are subject to change until reservation or deposit is paid and confirmed.